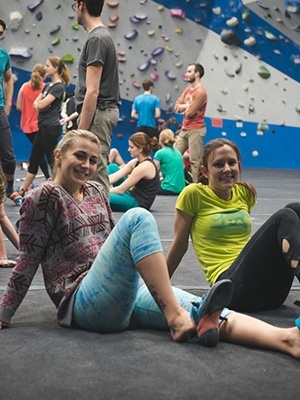 Earth Treks Blog helps expand the knowledge of climbers and increase their stoke! I could open this blog with a faux-inspirational intro about building a better tomorrow for yourself. Or about how no one is holding you back from being the best person you can be, except the doubts in your own mind. But I know you, mysterious reader. You’re too busy designing your plan of attack to smash your climbing and fitness goals into smithereens—you’ve got no time to tolerate platitudes and pontificating. So, without further ado, check this beta for maximizing your workouts in order to crush your 2019 climbing goals. Get the latest climbing news, tips and tricks straight to your inbox. Sunday morning provides crisp, fall air sifting through the madrone and oak trees as they shade the Tafoni Sandstone in Castle Rock State Park (CRSP). The costume party last night only contributes to my excitement, despite the lack of sleep. Rebolting has been so intriguing to me after years of seeing so much antiquated rock protection. I was overwhelmed at the opportunity to contribute to some local climbing areas. That morning, we set out with the Bay Area Climbers Coaltion (BACC) and gear provided by the American Safe Climbing Association (ASCA) to update some of the old bolts that protect the California Ridge area. As a personal trainer and fitness guru at Earth Treks, I hear a lot of the same mindset: “All of my climbing goals involve tall climbs on ropes. Why would I boulder?” At first glance, the logic behind the thought seems sound. If you want to run a faster mile, you spend a lot of time running miles. If you want to lift heavier weights, you… well, you lift heavier weights. The fact is that rock climbing, especially leading sport routes, demands a very precise ratio of power, strength, endurance and mental fortitude. That’s where bouldering comes in. I recently walked into my local climbing store for nothing in particular. As I was browsing, I came across a box and thought, “Is this box empty? Why are they displaying an empty box?” Skeptical, I opened the box and found...a climbing helmet! I was dumbfounded. Climbing helmets are normally bulky pieces! And while even the heavier versions aren’t that burdensome, at the end of a long day at the crag, I find myself tilting my head to the side and belaying while practicing neck rolls. As far as I'm concerned, cutting a few ounces can make a huge difference. As Fitness Program Manager of Earth Treks Golden and Englewood, I notice that a lot of our members are more than just avid climbers. You’re trail running, backpacking, mountain biking, skiing, snowboarding and more. That’s why we’re creating a fitness training series called Mountain Prep designed to get you ready to crush your other outdoor pursuits. It may only be October, but winter and, specifically, ski and snowboarding season is just around the corner. It may still be a while before we can get our first turns in, but now is the time to harness your upcoming ski and snowboarding excitement into exercises to get your body prepped for the season. Here’s a series of exercises you can start now so that your first ski day feels more like your 10th. You’re outside at your favorite crag or bouldering pit. The weather is perfect, you’ve been training hard to send your project and you’re geared up and ready to crush! You start climbing, your heart’s beating, you’re starting to sweat and your forearms are pumping out. You only have a few more moves until you send, but you don’t think you’re going to make it. What do you do? The answer: Breathe! Lead climbing is what I love most about this sport. While climbing can primarily be described as an individual sport, there is almost nothing more important to a lead climber’s success than trusting their belayer. This trust allows the climber to focus 100% on their climb and to commit to those harder and scarier moves. On the flip side, the fastest way to erase that trust is to give your climber a hard catch or, even worse, spike them. There are many tips, tricks and techniques that climbers learn and develop over the years to make themselves the best belayer possible in all scenarios. Some of my fondest climbing memories have been spent with friends, huddled around the same 15 foot tall boulder, figuring out the precise sequence to send, and laughing all the while. I love bouldering outside--it's really awesome! However, there are a few things you should know before you take your inside hobby into the great wide open.